Ballymoney’s young Speed Event ace Roger Gage continued to rattle the hillclimb establishment by taking Best Saloon honours at the Thoroughbred Sports Car Club’s annual Cultra Hillclimb on Saturday, June 11th. Considered the drive of the day, he hustled the family’s venerable Maguire Mini on to the Overall podium on his first visit to the twisty 700yd track in North Down’s award winning visitor attraction. 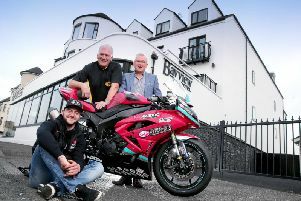 Two thousand visitors from 10 countries to the the Ulster Folk and Transport Museum saw Cultra Speed Hillclimb crown its fourth different champion in the past four years as Coleraine’s Jaye Nevin pipped the current NI Hillclimb Championship leader, Bangor’s Chris Houston, with a last run time of 32.58secs. Nevin had led throughout the day with Houston managing to get within 0.3secs on that last run thriller and just 0.4secs ahead of Roger. The Ards and North Down Borough Council supported competition had attracted a capacity entry of 100 drivers from six countries, all bar one completing the day, but thus allowing the only remaining Reserve to take part also. The sports cars of Dungiven’s Gerard O’Connell and another ‘Young Gun’, Mark Francis from Newtownards, took the next two places with multiple times Cultra Saloon Champion, Roger’s father Rudi, completing the top six, as he continues to develop his newly built version of the Maguire Mini. O’Connell’s chase for that final podium place saw him finish just 0.2secs shy of the younger Gage with a new Outright Sports Car Record time of 33.43secs.